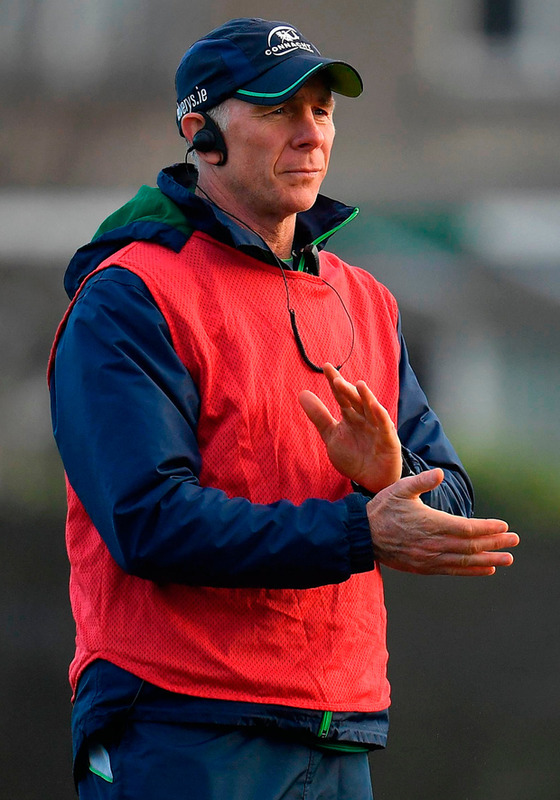 Ireland's difficulties became Connacht’s last week and, with Jack Carty remaining in Belfast to deputise Jonathan Sexton, their coach Andy Friend has been prompted into a decisive change at out-half. After Conor Fitzgerald suffered more than most in last week’’s humbling defeat in Glasgow – while four stalwarts were on Irish duty in Rome, including debutant Jack Carty – Kyle Godwin has been selected at ten. Connacht can, though, welcome back four Irish squad members, while scrum-half Kieran Marmion also remains ahead of a “must-win” game as the province seeks to maintain its play-off and Champions Cup qualification hopes. Connacht are clinging on to fourth place on points difference but a similarly depleted Ospreys are only three points behind them; an away victory today would be a hammer blow for the westerners and Friend is keen to remove the anxiety from his men. “There is added weight on everyone,” he concedes. “We have actually said to the players, don’t worry about any of that. If we keep winning we are okay. “We have still got Cardiff who are now equal points with us. But if we win the remainder of the games we finish ahead. Ireland may taketh away but they also giveth; the second-row partnership which started the win in Italy will do so again today; good news for local fans but bad news for a pair who seem certain now not to face France. Warren Gatland has not released any Ospreys; James Hook’s midfield return is the only change to the side which lost to Munster. Form for both sides is indifferent; the quest for the result promises to be nervous. Connacht – T O’Halloran; S Fitzgerald, T Farrell, P Robb, M Healy; K Godwin, K Marmion; D Buckley, S Delahunt, F Bealham, Q Roux, U Dillane, E McKeon, C Fainga’a, J Butler (capt). Reps: T McCartney, P McCabe, C Carey, J Cannon, P Boyle, C Blade, T Daly, C Kelleher. Ospreys – D Evans; H Dirksen, C Allen, J Hook, K Giles; L Price, M Aubrey; J Lay, S Baldwin, T Botha, J King, B Davies, O Cracknell (capt), S Cross, R McCusker. Reps: S Otten, R Jenkins, M Fia, L Ashley, W Griffiths, H Morgan, T Williams, L Morgan.